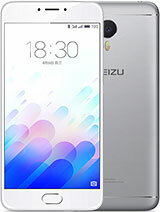 This is another affordable smartphone from Meizu that won't leave a hole in your pocket because the smartphone is so cheap and affordable. Meizu M3 is a 5"inche display smartphone running on Android 5.1 lollipop and its enabled with 4G LTE network which is also supported for Ntel. Meizu M3 has a back camera of 13MP with led flash and front camera of 5MP with led flash also. It has a battery cap of 2870mAh. Take a look at the complete specs, price and launch date below.